Alternate aerial view of property. Alternate arial view of property. View of main home with deck overlooking lawn and mountain view. View of estate and lawn for ceremony and tented reception. 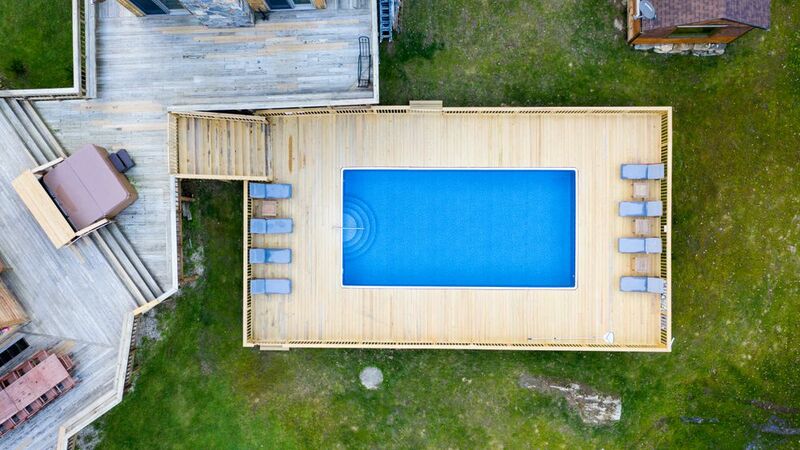 Aerial view of main home and guest house with pool and fire pit. Aerial view of estate and grounds. Outdoor fire pit available for use. 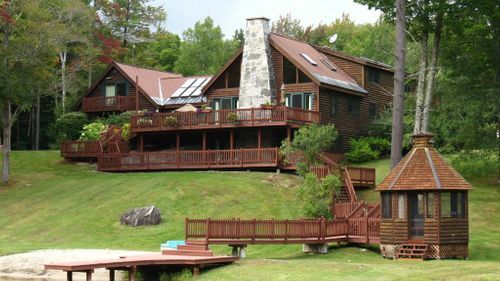 view of main home with deck and guest house in the distance. View of deck and outdoor dining table and grill. Outdoor dining table for 22. Perfect for a rehearsal dinner before the big day. Alternate view of pool with tree-lined views. Hot tub with scenic views. 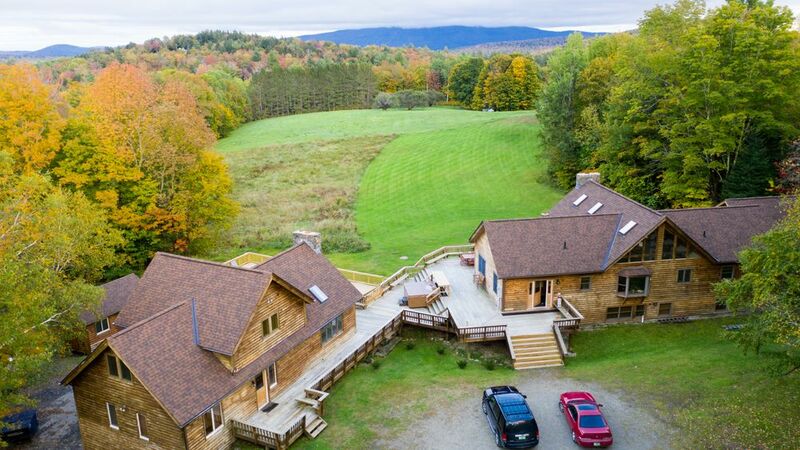 Just 20 minutes outside Manchester, Vermont, this estate features two luxury log homes truly made for a weekend of opulence. 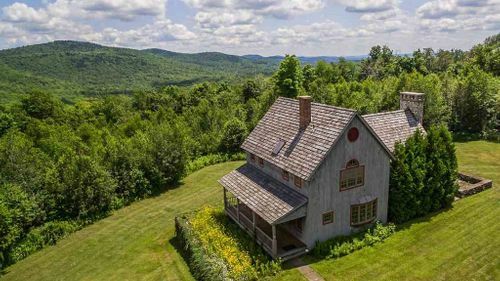 On-top 20 acres rest both a main home and accompanying guest-house with adjoining deck and pool, multiple fireplaces, open concept kitchen and dining areas, sauna, hot-tub, game room and bar. 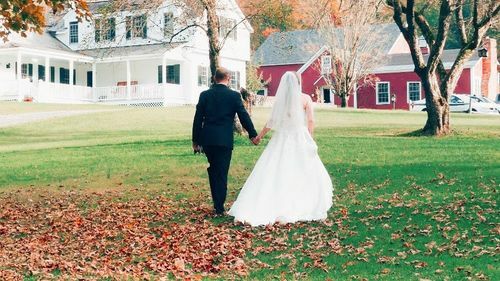 This rental includes a three night stay for 30 guests and up to 250 guests for an outdoor ceremony, cocktail hour on the expansive deck and tented reception with mountain and forest views. 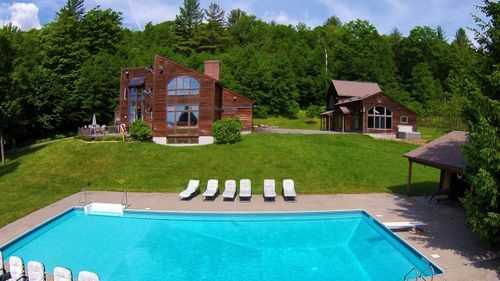 If you are looking for log-cabin luxury, look no further than this one-of-a-kind open space venue log-home escape. Only 9 Weddings Remaining for 2019 — then calendar will close.? Parking - Up to 100 cars along drive and road. Full cellular and internet service available. Kitchen Access - Residential space available. Fire-pit - Available; wood not provided. Electric Power - Available from main home; Generators recommended for receptions greater than 100 ft. from house. 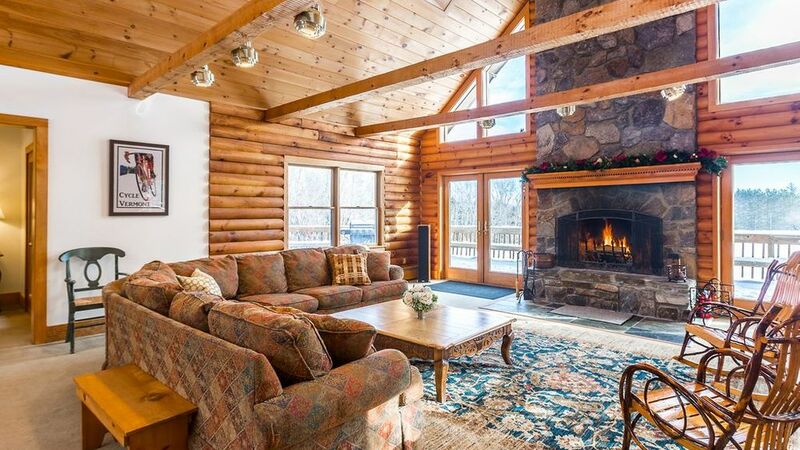 Majestic double-log home estate featuring a 4,000 square foot adjoining deck. The main house has 9 beautifully decorated bedrooms (including four with king beds and one with a queen bed), 6 bathrooms, 2 family rooms with beautiful fireplaces on each level, and a fully equipped kitchen. It also has a media entertainment room and a children’s room. 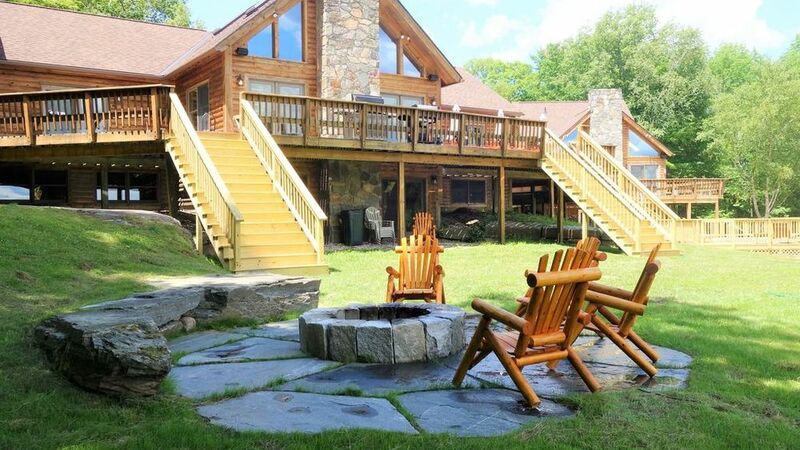 The Guest house has 4 bedrooms (including two with king beds), 2 bathrooms, a spacious sun-filled family living room with hardwood floors and a stone fireplace. 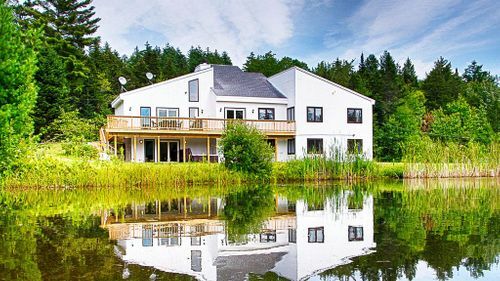 The home includes a fully equipped kitchen with a large dining table, and a game room with bar, TV, and ping pong and a billiard tables. Open concept kitchen and dining room. Main house. Sauna sitting area with open window view. Sauna with shower and sitting area. Main Home: BR #1 - Master, King Bed and adjoining bath. Main Home: BR #2, King Bed. Main Floor. Main Home: BR #3, Queen Bed. Main Home: BR #4. King Bed. Main Home: BR #5. Twin Bunk Beds. Main Home: BR #6. Trundle. Main Home: BR #7. King Bed. Main Home. BR #8. Two twin bunk beds. Main Home: #9. Kids room. Aerial view of family room. Guest house. Ping pong table and pool table. Guest house. Bar area and game room. Guest house. Guest House. BR #10. King Bed. Guest House. BR #11. King Bed. Guest House. BR #12. Two twin bunk beds. Guest house. BR #13. Trundle. Bathroom. Main house. Main floor. Pets - Upon special request. Open to late night reception hours upon request. Smoking Policy: No smoking inside. Outside in designated areas only . Open Flame Policy: Wedding torches and bonfires authorized with approved permit from local fire department. ; No candles inside house or on deck. Town Ordinances: Fireworks permitted with prior approval from local fire department.